On Norwegian Getaway, the entrance to Le Bistro resembles the exterior of a French Cafe. A canopy reminiscent of some metro stations in Paris leads up to the doorway flanked on either side by wrought-iron tables sidewalk cafe style. Overhead is the ship's giant chandelier that cuts through a three deck high atrium. Inside, Le Bistro recalls post war Paris with large black and white photos on the walls. A few of the tables look out windows onto the Deck 6 interior promenade but most are totally absorbed within the softly lit restaurant. On Getwaway, Le Bistro is not as large as Cagney's Steakhouse or the Moderno Churascaria. Along the same lines, Le Bistro does not have outdoor tables on the Deck 8 Waterfront that Cagney's and Moderno have. But this is entirely appropriate as Le Bistro's charm flows from its intimate and romantic atmosphere. Indeed, even the sidewalk cafe tables outside of Le Bistro under the chandelier are less desirable places to dine than those inside the restaurant because the noise of the casino on the deck above and of the passengers hurrying by intrudes upon the spell this restaurant seeks to cast. Le Bistro was Norwegian Cruise Line's first specialty restaurant. In the years since this venue first went to sea, it has earned a considerable reputation. Despite the name, Le Bistro is not a classic French bistro but rather a fine dining experience in the French style. A classic bistro is actually a low end venue where diners eat whatever the cook has decided to prepare that evening. At Le Bistro, guests have a variety of choices that recall French fine dining albeit modified to suit contemporary North American tastes. During our visit, Le Bistro was constantly busy. No table remained empty for long. This is only to be expected because, as above, the restaurant has a very good reputation with Norwegian Cruise Line regulars. 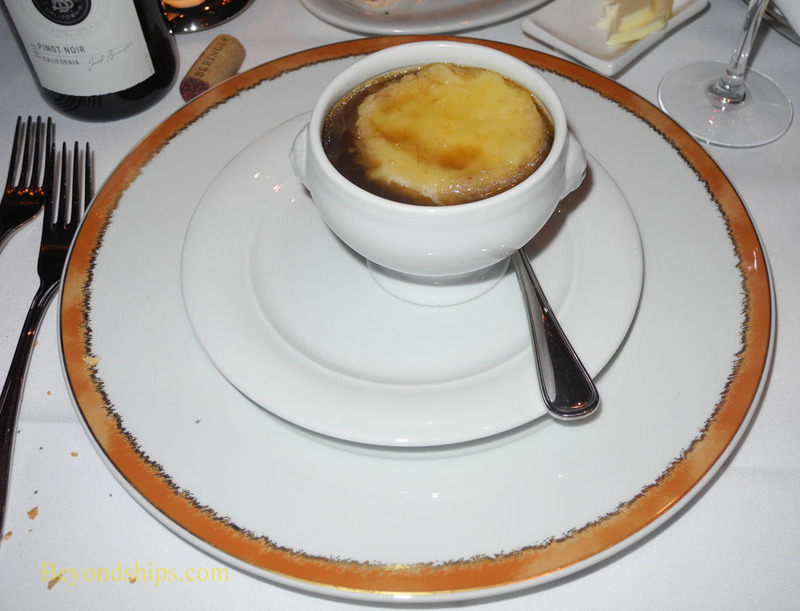 For starters, there is the classic French onion soup. Le Bistro prepares it with less cheese than some restaurants. Rather than encrusting the mouth of the bowl with cheese, the gruyere cheese is essentially limited to the cheese on the piece of French bread that floats in the soup. This allows more of the flavor of the onions, spiced with brandy, to come through. A delightful surprise was the salade gourmande. 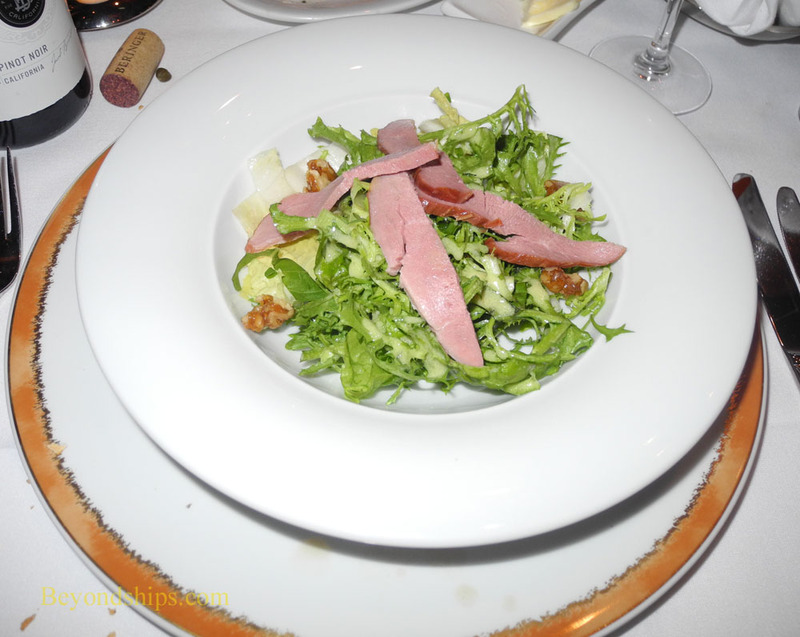 This was a simple salad, highligted with smoked duck, endives and caramelized walnuts, which contrasted with the light champagne vinegrette. 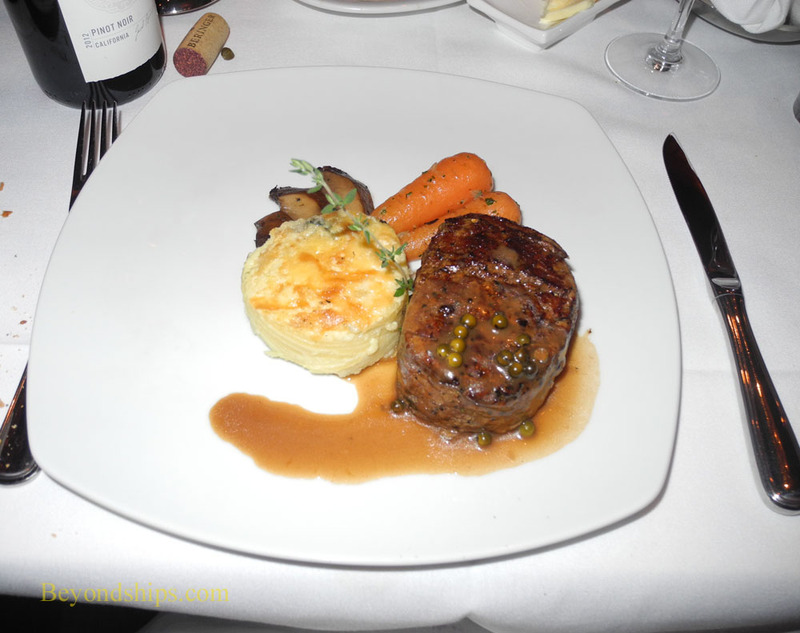 The highlight of our dinner at Le Bistro was the filet de boeuf grille - - a filet mignon. This dish has long been one of our favorites on Le Bistro's menu. However, since 2013, Norwegian has been using certified black angus beef. While “certified” often seems to be just a marketing term with have little real world significance, here there was substance behind the words. The melt-in-your-mouth tender beef brought this already good dish to a new level. A green peppercorn sauce provided contrast and brought out the subtle flavors of the dish. Simply outstanding. After such an entree, dessert is an anticlimax. However, the chocolate fondue for two is fun. A variety of different fruits including slices of banana, strawberries and melon arrive at the table inside a half pineapple that has been partially hollowed out to form a bowl. Using fondue forks, the guests dip the pieces of fruit into a pot of warm milk chocolate. The tart fruit contrasts well against the rich sweet chocolate. There is a cover charge for Le Bistro.